Have you ever heard someone misuse building performance terminology such as vapor retarder, rainscreen, or moisture barrier? Have you ever asked yourself what these words mean to the other person? There’s a good chance your meaning is different from their understanding. Building performance terminology can be confusing when meanings are ambiguous. Misunderstanding creates confusion that leads to mistakes in construction and inefficiencies in operation. Many terms used in design documentation and everyday discussion are loosely defined. The AIA’s Building Performance knowledge community seeks to solve this problem by creating a Best Practice Standard (glossary) of Building Performance Terminology for terms that often misused. This standard will contain the best practice definitions for the most ambiguous building performance related terms and will be available to design professionals seeking clarification. What are the most challenging building performance related terms? Who are the design and construction professional associations with influence over the use of these terms? What are the definitions for each term according to the design and construction associations and common technical resources? Which terms have ambiguous definitions? What are the accepted best practice definitions for the ambiguous terms according to the Building Performance knowledge community? Based on the experience of the research team, it is hypothesized that some building performance terms are confusing because they are defined differently in popular technical resources and by professional associations with influence over architects’ design vocabulary. To systematically identify and define the commonly misused terms a four step process was developed. This process is designed to incorporate the experience of the research team and the information from technical building performance resources to identify the most ambiguous terms for inclusion in the standard. Beginning in December 2016, this project continues through Summer 2017. Collecting terms from the members of the research team they repeatedly see misused in practice was the first task. This exhaustive list of terms—over 180—is the starting point for the standard. Many of these terms are easily defined like vapor diffusion, capillary, and condensation. Presumably, these terms are on the list because they are misunderstood, not because they are ambiguous. Other terms such as movement joint, thermal short-circuit, and weather resistive barrier made the list because it is expected that they are loosely defined with possible anecdotal meanings making them difficult to clearly to use or a term to completely avoid. To determine which terms have accepted and established definitions and which ones do not, a literature search of common technical resources is necessary, and identifying the resources is the next step. The terms are divided into five comprehensive categories: Building Science, Environmental Control, Wall Assemblies, Roof Assemblies, and Construction Materials. Future iterations of this research can include other categories such as Below Grade Assemblies and Fenestration Systems. Within these categories, the ambiguous terms are the ones the research team seeks to define. 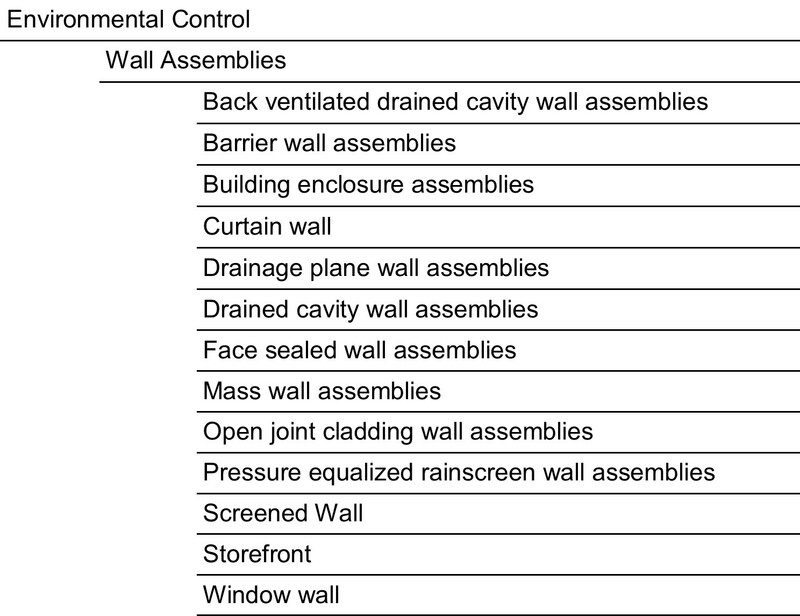 Below, Table 1 is a selection of the contributed terms in the category of wall assemblies within Environmental Control. An annotated bibliography is a list of applicable resources that includes a short description of the material. The annotated bibliography for this project began with a list of professional associations, contributed by the research team, that have influence over the terminology architects use such as the International Code Council, the Air Barrier Association of America, and the National Institute of Building Sciences. From this list, numerous online and printed resources were identified that architects may use to find information about building performance design. Thirty-one professional associations and 12 notable printed resources were annotated. This list does not include every possible resource but concentrates on the resources commonly found in architecture offices or trusted associations that provide building performance information. These resources are important to survey because the information within their pages informs designers and the terminology they use. Determining how each resource uses and defines the terms on the list is the next task. From the annotated bibliography the research team narrowed down the list of resources to include other building performance glossaries such as the U.S. Department of Energy’s Building America Building Science Translator and popular online and printed resources architects use like the Whole Building Design Guide, Building Science Corporation’s articles and books, and ASHRAE 90.1. Each resource on the concise bibliography will be used to define each of 180 terms on the list. This process will eliminate terms that have widely accepted definitions and highlight terms that are either undefined or have varied definitions. Once these ambiguous terms are collected the Building Performance Definitions Project research team will appropriately define them based on their expertise and experience. This is the point at which the research project stands. The comprehensive list of definitions and resulting list of ambiguous terms are expected to be complete by mid-April. The research team’s real work begins in Task 4. At this point, a verified list of ambiguous terms will be identified and the various definitions for each term collected. Using their expertise, experience in practice and the results of the literature search the team will come to a consensus on the best practice definition for each term. This process is scheduled to be completed this summer. The result of this effort will be the Best Practice Standard of Building Performance Terminology. As buildings increase in complexity and the number of disciplines working on a project grows it is important for the terminology used to describe building performance assemblies to be consistent. This Best Practice Standard of Building Performance Terminology is a first step in consolidating and clarifying the most challenging terminology for design professionals. The format of this new standard is expected to be interactive and available online. Expanding the standard is easily accomplished by following the same process with new lists of terms. The goal of this project is to dispel the mystery of challenging terminology for architects so the way building assemblies are described is clearer, thus creating fewer problems in construction and better buildings overall.